A trouble-hit vintage railway on the Isle of Man saw 95 "safety issues" over the past three years, new figures have revealed. 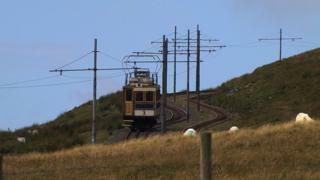 The Snaefell Mountain Railway, which joins Laxey village with the summit of Snaefell, is currently closed amid a health and safety inquiry. The electric railway runs for about five miles (8 km) and is part of the Manx Electric Railway, which is recorded in the Guinness Book of World Records for operating the oldest tramcar in the world. In August an "out of control tram" travelled down the mountain for about 180ft (54m) before the crew were able to switch from a modern braking system to an older one.